Rising above a dramatic landscape in northeastern New Mexico is Capulin Volcano—a unique place of mountains, plains, and sky. Born of fire and forces continually reshaping the earth’s surface, Capulin Volcano National Monument provides access to nature’s most awe-inspiring work. An easy three-hour drive from Santa Fe, New Mexico; Amarillo, Texas; or Colorado Springs, Colorado; visitors will discover one of the nation’s best examples of a volcanic cinder cone and excellent views of the surrounding area. The monument hosts a variety of engaging activities and projects throughout the summer months. Take flight with the hummingbird monitoring project and learn how far a hummingbird can travel during its migration, how fast a hummingbird’s heart beats, or how big their eggs are when laid. Observe the research team banding four different species of hummingbirds: broad-tailed, black-chinned, calliope, and rufous. While these birds bob and weave through the sky, they provide never-ending amounts of fun and entertainment for all. Children burst with joy as they are allowed to hold the birds and set them free. Adult visitors become riveted with the Hall Trap system, an ingenuous devise used to aid trappers in catching these elusive birds. 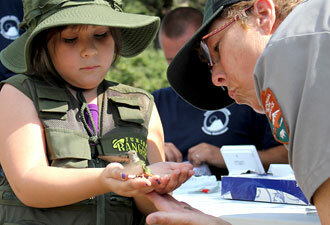 Bird banding is performed on Fridays from May to August by trained rangers and volunteers. 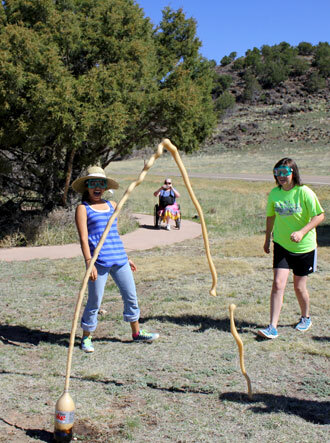 Stop in for the Summer Market, taking place from mid-June to early August every year at Capulin Volcano. August 3 finishes up the 2014 market series, treating visitors to a taste of savory food, great music, and handcrafted merchandise from across the Southwest. Regional favorites include Sangre de Cristo honey, smoky BBQ, spicy chile ristras, and solar coffee. Choose between scrumptious treats from cookies and fry bread to fresh fruit and vegetables. Visitors to the market can sit back and enjoy entertainment from one of many phenomenal acts, participate in Powwow dancing, or attend a Junior Ranger program at the site’s outdoor classroom. There are also marvelous goods from several artists and artisans featuring original cedar and stone inlay bowls, paintings, custom jewelry and handmade soap. In other seasons, visitors will still find plenty to do. Travel the two-mile paved Volcano Rim Road to enjoy picturesque views from the highest peak overlooking the Raton-Clayton Volcanic Field. Check out the view of the Rocky Mountains from the rim or descend into the crater vent. Stop in at the visitor center to enjoy the exhibits and park video, pick up a Junior Ranger book, and explore the park store. 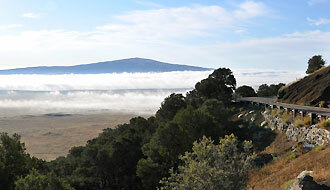 Capulin Volcano is open daily except on Thanksgiving, Christmas and New Year’s Day. From Memorial Day to Labor Day, park hours are from 8:30 a.m. to 5 p.m., and visitors can drive to the top until 10 minutes before closing time. After Labor Day, the park operates from 8:00 a.m. to 4:30 p.m. Guests arriving after hours are welcome to walk or bike the Volcano Rim Road or hike the scenic Lava Flow and Boca trails with the chance of catching a glimpse of some of area wildlife like mule deer, pronghorn, or gray fox.